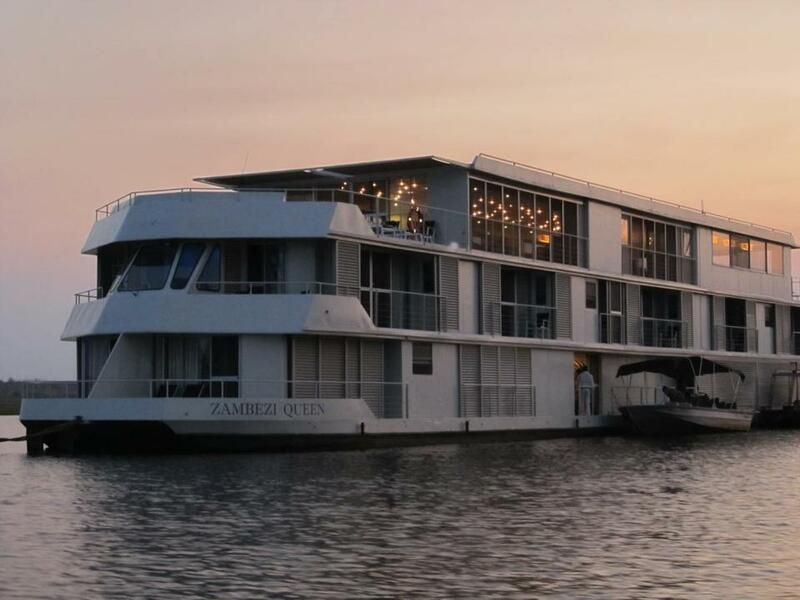 Passengers boarded the Zambezi Queen from a tender boat, returning to the 14-suite luxury vessel after a sunset cruise on the Chobe River, which divides Botswana from Namibia in south central Africa. It’s not hard to understand why Chobe elicits such reverence. Dividing Botswana from Namibia, the wildlife-rich waterway borders Botswana’s renowned Chobe National Park and is home to an astonishing density of both prey and predator, all bound by a primal dependence on the river for food and shelter. Chobe’s fish-rich waters also provide sustenance to the nearby villages, and fishermen in handmade, dug-out canoes dot the waterway. From the Zambezi Queen’s top deck, passengers can see near and far — and enjoy feeling ignored by wildlife. I will admit to originally being a skeptic. Before boarding I was a safari purist, believing that game viewing must take place deep in the bush and not from a boat. Every inch of the Zambezi Queen is designed for unimpeded views. The massive upper deck patio flows into an airy dining area complete with wide windows and sliding doors. And all the suites have floor-to-ceiling windows that lead out to private balconies — the perfect place to greet the dawn. With none of the typical 5 a.m. wake-up calls of traditional safaris, I planned to catch up on shut-eye only to find that the stunning sunrise trumped sleeping in. Sitting on my balcony in my pajamas, I relax with a coffee as we float past buffalo, elephants, and a solitary fisherman casting his net in the river for that first catch of the day. The Zambezi Queen’s environmental ethos is in tune with its natural surroundings. So as not to cause damage to the riverbeds, jet propulsion is used instead of propellers, hot water is solar heated, the toiletries are biodegradable. Suites use fans and cooling river breezes rather than air-conditioners to cut the heat. 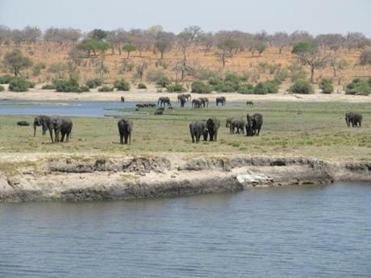 There is one concession to land lubbers — a guided visit to Botswana’s Chobe National Park, famed for having one of the largest concentrations of elephants in the world. Though it feels strange to be in a safari vehicle, relying on luck and speed for a good viewing, the park offers us some stellar sightings. We are lucky enough to spot the rare puku antelope, a group of sable, and some resplendent carmine bee eaters. We also see more elephants and buffalo but not nearly the numbers we saw from the deck. Sudden ripples in the water alert us to a croc that lumbers out of the river to sun himself on the bank while two curious kingfishers look on. A monitor lizard digs for stranded fish in the rocks nearby while an African fishing eagle in a nearby tree seems put out by our appearance and moves off with an haunting cry. But come dusk it’s the sunset that holds our attention. With wine glasses refilled, we settle in to watch the sky transform from blue to pink to purple until the river swallows up the sun and fishermen in handmade canoes pass us with a wave as they head for home. Dinner tonight — our last night — is a land-based, traditional boma (an open-air barbeque around a bonfire). Now that night has fallen sounds replace sights; the unmistakable song of the nightjars is soon drowned out by the lovelorn call of frogs hunting for mates, and the cacophonous chirp of crickets. It’s the perfect farewell orchestra. Under a star-stained sky, drunk on a heady mix of wine and great food, and filled with the collective wistfulness that inevitably marks the end of a communal adventure, many of us begin to dance around the bonfire and stamp our footprints in the banks of the river. Sandra MacGregor can be reached at sandra-macgregor.com.